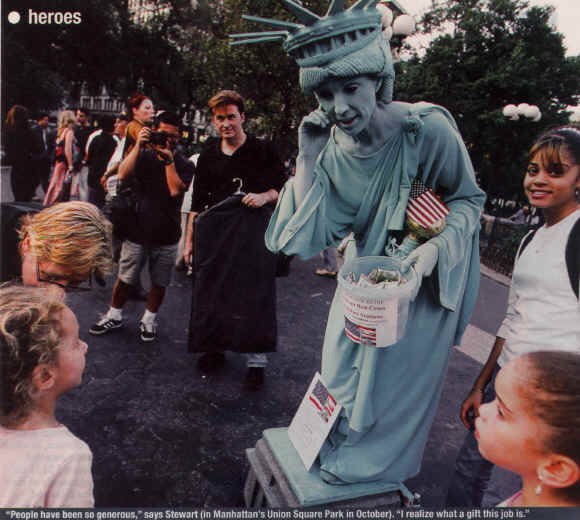 Living Liberty -- the "living" Statue of Liberty -- standing amongst the people after September 11. After a dozen years impersonating the Statue of Liberty, Jennifer Stewart was ready to throw in the torch. "I couldn't believe," she says, "that God put me here just to perform in a green toga at corporate lunches." Then came the Sept. 11 attacks. Since then Stewart, 44, averaging three to four hours a day standing motionless on the streets of New York City, has raised $10,000 for the American Red Cross and her local Brooklyn firehouse, which lost seven men in the Twin Towers. Stewart, who grew up in Audubon, Iowa, has been perfecting her Lady Liberty act since 1986, the statue's centennial year, when she won a national Statue of Liberty look-alike contest. the trade-show Web site bizbash.com, who has worked with Stewart. "People wait all day to get their pictures taken with her."